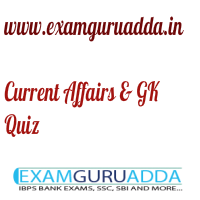 Dear Readers Examguruadda.in presents Current Affairs quiz of 25-26th December 2016 that cover important current affair events. Current Affairs quiz for IBPS PO,clerk, RRB-Po,Clerk, SBI, NIACL,Railways and SSC Exams. 1. India’s longest expressway connects which cities? 2. The Reserve Bank of India (RBI) has opened a banking ombudsman office in Uttarakhand at which place? 3. Smart Anti-Airfield Weapon (SAAW) is developed by whom? 4. Who was chosen by Pope Francis as the first woman to direct the Vatican Museums? 5. Who was ranked first on the 2016 Forbes India Celebrity 100 List? 6. Singer George Michael passes away recently. He belongs to which country? 7. Dinanath Bhargava, who sketched national emblem ‘Lion Capital of Ashoka’, was belonged to which state of India? 8. “Nagar Uday Abhiyan” has been launched by which state government of India? 9. Who has won the 2016 All India Football Federation (AIFF) Player of the Year? 10. The 2018 Women’s Hockey World Cup will be held in which country?